As a runner, I am really into race times, paces, etc. Not that I obsess over comparing myself to others, but it really interests me to see what types of runners are hitting specific times. Like elite club runners finishing sub-16 minute 5K’s, or a 45-year-old running a 1:25 half marathon. It’s really what motivates me and encourages me to continue to set goals. As I think about myself getting older, seeing these runners still smashing times and setting PRs inspires me to keep pushing myself. When I see 60+ year old men and women running alongside me in races, I’m not embarrassed or intimidated because we’re on the same running level, I’m excited to realize that my best is still in front of me (if I want it to be). Why you run: I run to challenge myself. There are a lot of things and circumstances in life that we can’t control, but with running, I can control my effort and how hard I push myself, and as I realize my limits, it allows me to learn what I can and need to do to extend those limits. When did you get started running: I started running in 9th grade. I wanted to play football, but at about 5’6″ and 120 pounds my grandma was scared that I would get hurt. So, I joined the cross country team assuming it would be a good way to stay in shape for basketball season–it ended up being one of the best decisions I made entering high school. Have you taken a break from running: I ran on the club cross country team during my freshman year of college. As a sophomore, I made the JV basketball team and was a member for the next two years. So from my sophomore year of undergrad until I finished my master’s degree (2004-2011) I didn’t do much running. A lot of basketball, “college stuff,” and trying to figure out what I was going to do with my life took up the majority of my non-running period. Coach or training group: Currently training for Chicago Marathon and our charity team coach is Seth Kopf of Kopf Running (based in Chicago). While training here in D.C., I run with friends and members of District Running Collective and District TriathlonThe hardest race you’ve ever run: Last year, I “raced” in the Under Armour Mountain Running Series race held at Killington Ski Resort in Vermont. I knew it was a “trail” race, so with my cross country experience I figured no big deal. I chose to run the half-marathon during the weekend, thinking a time of around 2 hours would be solid for a trail race with a “little” elevation…The course was like a roller coaster on foot! At the start near the base of the mountain the temperature was sunny and around 70 degrees, but as we got higher and reached the peak 4700′ elevation, the temperature dropped nearly 15 degrees and we had to run through clouds! I found myself racing against the race cutoff time for the first time ever. Ultimately, I finished with about 30 minutes to spare, but I felt the effects of that race for a whole week! Most adventurous decision you’ve made with your running: See above! Running mentors: My high school coach, Nathaniel Carter (Union Pines H.S., North Carolina). He introduced me to running and helped me to love it. He also showed me how running can benefit communities and help promote character and self-esteem with young children. He presented a blueprint that combined community service and running that I have tried my best to incorporate and emulate within the community of families and children I serve. Pet peeve: When I’m running and give a little wave or “head nod” as I pass by runners coming from the other direction and they don’t acknowledge or reciprocate! Goals: One day qualify for Boston! Have you dealt with a major injury: In 2014, I tore my meniscus in a local co-rec basketball league and had to have it surgically repaired. It took four months of physical therapy, but in 2015 I ran my first marathon. 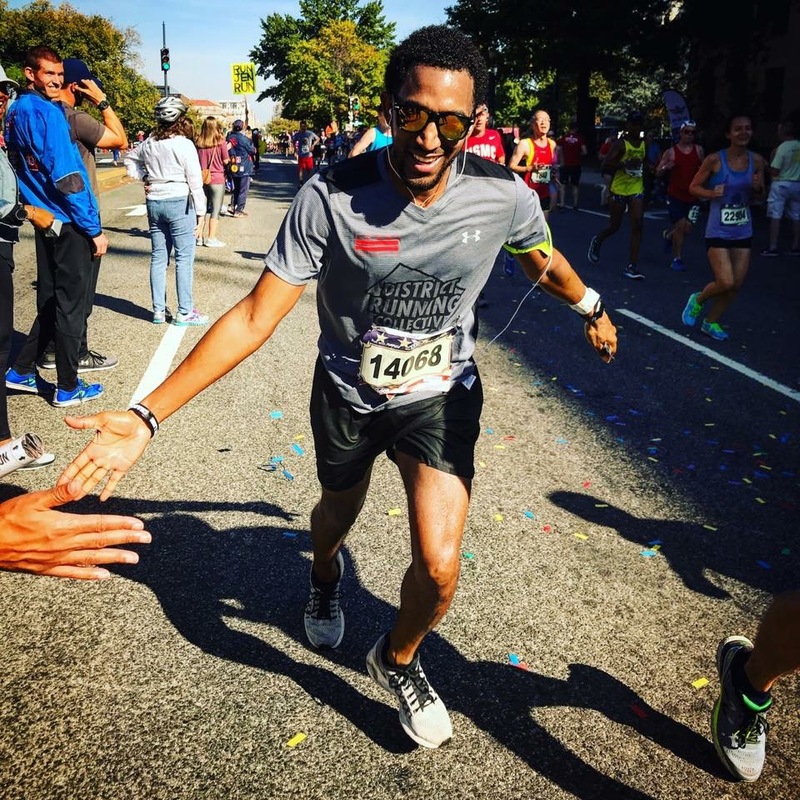 Why is the D.C. area a great place to be a runner: Running in DC is so motivating! You’re not going to get far in this city without seeing runners on sidewalks or trails, or running in place at lights waiting for traffic. If you don’t run, seeing everyone here running makes you wonder if it’s something you should probably be doing as well. The running community is great and there are so many resources for beginners all the way to elites. There’s really no excuse not to run in DC. With the National Mall being perhaps the most iconic running route ever, it’s the best way to be a tourist! Running has allowed me to see so many different aspects of the city, most of which you otherwise wouldn’t see or know about.